The famous Hallerbos bluebells are starting to unfurl and should be in full bloom by the weekend, according to Agency for Nature and Forest, which manages the site. Tens of thousands of people visit the forest in Halle, just outside Brussels, every spring. Last weekend already found hundreds of visitors, both locals and tourists, in the forest, which is covered by a carpet of bluebells for a few weeks every spring, creating quite the fairy-tale spectacle. A bit late this year because of the chilly weather, the colour is finally starting to appear and will be at its finest between 20 April and 1 May. The giant sequoia forest is also home to pretty white wood anemone, true oxlip and periwinkle, all-in bloom now. Many walking paths criss-cross the forest, and there are several signposted walks from two to seven kilometres. There are parking facilities at the forest, but visitors are encouraged to take the train to the Halle station and hop on board a free shuttle bus provided by De Lijn. SNCB also has a special Hallerbos B-Excursion ticket, which includes a bike rental. 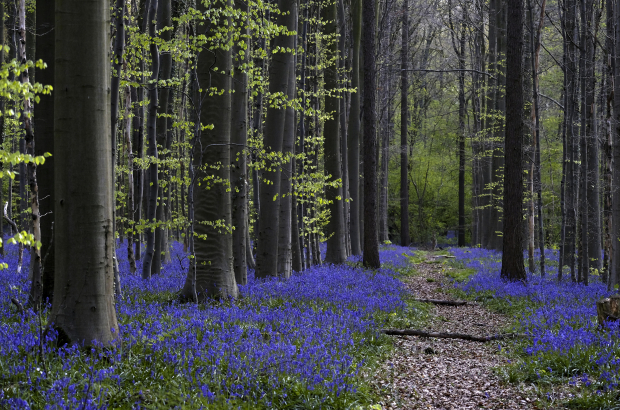 Other forests in Belgium also sport a mass of bluebells this time of year, including the Koppenbergbos in Oudenaarde, East Flanders, the Helleketelbos (literally Hell’s Kettle Forest) in Poperinge, West Flanders, and the Grand Leez in northern Namur province. Though not as accessible as the Hallerbos when it comes seeing bluebells, there will be a fraction of the tourists. Wonderful post once again from you and I will share this on professional dissertation help page too so that your good work can be seen. Keep it up and keep sharing!